Cinnamon sugar cheesecake goodness without the crash or the dairy! Like a cinnamon roll cheesecake remixed as a fat bomb. To make the almond flour center, combine the almond flour, coconut oil, and erythritol in a small bowl. Knead with your hands until incorporated. 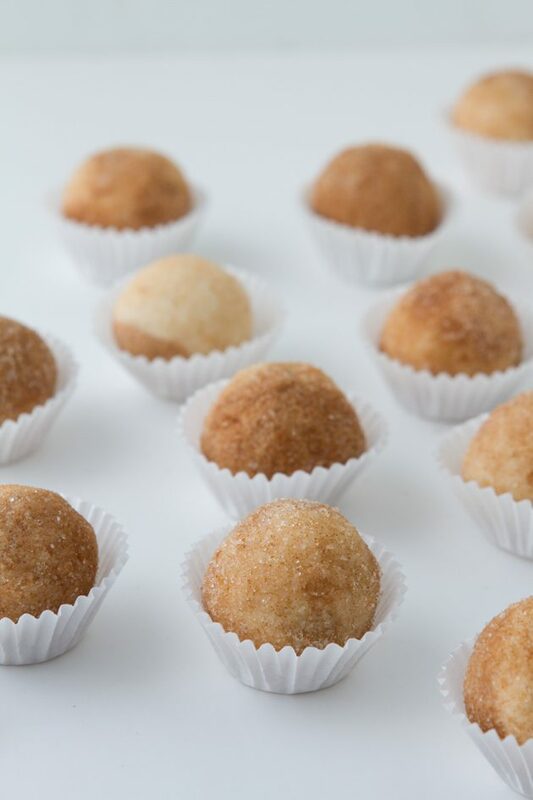 Separate the mixture into 13 pieces and roll into balls. Place the balls on a parchment paper lined cookie sheet and place in the freezer. Meanwhile, combine the cream cheese, coconut oil and erythritol in a small bowl. Divide the mixture between two bowls. In one of the cream cheese bowls, add ground cinnamon and mix until incorporated. Place in the freezer for one hour. Prepare the cinnamon sugar topping by combining the ingredients in a small bowl. Set aside. Once chilled, scoop a teaspoon of the cinnamon cream cheese mixture and a teaspoon of the plain cream cheese mixture onto a piece of the parchment. 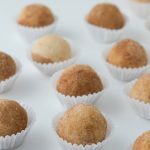 Place one of the almond flour balls in the center. Pick up the pile of cream cheese and almond flour ball and roll between your palms until the ball is in the middle and the cream cheese surrounds it. Place in the cinnamon sugar bowl and roll in the sugar until coated. Place the coated ball back on the parchment paper and place in the freezer. Repeat with remaining almond flour balls and cream cheese mixes. Allow the balls to chill for 20 minutes before enjoying. Keep stored in the fridge for up to 7 days or the freezer for up to 30 days. Best served when set at room temperature for 15 to 20 minutes.